Hello friends and Happy June! The weather is really crazy here and it feels like winter. I will be happy when it warms up and summer will finally arrive! LOL. I really enjoy crocheting during the long winter months and I made a few baby blankets and hats to share with you. This is a baby blanket and baby hat set I made. I also made a white baby hat with a small colorful flower attached to the hat. The pattern for the white baby hat can be found HERE. The yarn I used for the hat is from Caron Wintuk worsted weight yarn in an off white color. I'm not sure if this yarn is still available as it was given to me from my mom many years ago. I used an H or I size US crochet hook. To make the attached flower the pattern can be found HERE. The yarn I used for the flower was thin multi colored yarn. (I'm not sure who makes it since it did not have a label on it). You can use any colored yarn you like. The baby blanket I crocheted is a granny square extended and made into a blanket. To see directions on how to make your own granny square baby blanket you can click HERE. To make the yellow crochet baby hat you can use the pattern HERE. The yarn that I used for the blanket and the hat is from Lion Brand Yarn in the color 157 Pastel Yellow. The crochet hook is US size I.
I have made so many of the crochet granny square baby blankets to donate for my church fall fair and for people in my family having babies. They are great blankets to use for an infant baby carriage. The baby hat is new to me as I just learned how to make them. My next project I want to learn how to make is crochet baby booties. I love learning new items to crochet and new crochet stitches. Have you crocheted anything lately? Thanks so much for stopping by and I hope I have inspired some of you to make some crochet baby items. Enjoy your week and weekend. Jess and I will see you all back here on Monday for our Cooking and Crafting with J & J Link Up and winner of our Giveaway! You have been quite busy, dear Julie. The hats are just precious! Hope the sale goes great. The crochet blankets and hats are cute. WOW that is some beautiful baby items. Your work is so good and what a lucky person to purchase these at the church sale. Thanks so much for sharing these beautiful items with us. What sweet treasures you have made, Julie! I love them all. These are all so cute. I especially love the white hat with the colorful flower! It has been crazy weather! We were in New England and it was cold and rainy! I think we're getting very hot weather next week. I'd like a little something in between. I just LOVE working up baby blankets and hat <3 And they usually sell pretty well at craft fairs and such too. Best of luck to your church! Cute hats! I keep meaning to have my mother in law teach me to crochet..although I can barely sew on a button so we will see! I hope your weather gets better. It's been cold and rainy in NJ but this weekend it's supposed to be HOT! Such cute baby hats! I miss my mom as she crochets hats for miss T. How fun that your church organizes a county fair for your crafts. I'm sure you'll enjoy it! These are beautiful. I have toyed with crocheting, but mostly stick with blankets because they are square. I sure do admire you for tackling these projects and having them turn out so sweet and pretty. What lovely gifts! Caron Wintuk is indeed discontinued, but I did find some for sale by people that are cleaning out their stashes. If you've never made booties before, then you've got to check out the "Crossover Baby Booties" (free pattern on Ravelry). It's not your classic bootie style, but they're so easy and quick to make. 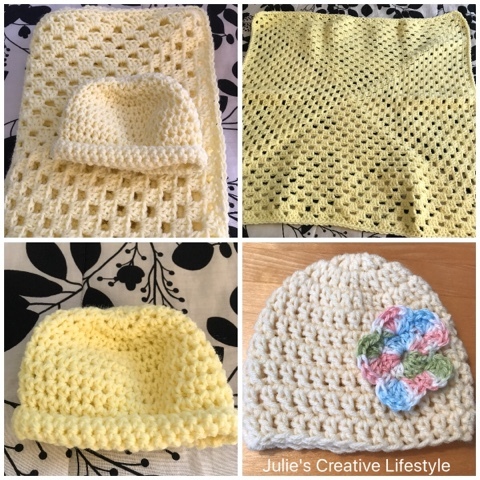 What beautiful crocheted baby items, Julie! I need to make a blanket for my grand baby that will be born this coming October, and my DIL wants it done in a mint color. I'd better get busy! Very sweet! How nice to take the time to make such nice things to sell for your church. I used to knit and crochet prayer shawls for a local ministry that were donated to people recovering from major diseases. It is rewarding work. Very pretty! Thanks so much for stopping by! They are so lovely! Beautiful work! 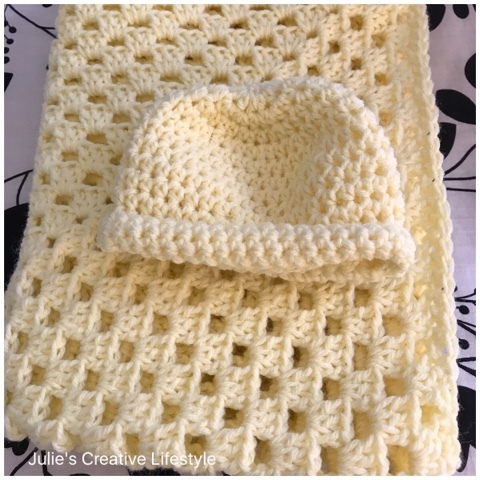 Your baby blankets and hats are so sweet, Julie. I just know they will be treasured! Thanks for sharing @Vintage Charm! These are so sweet Julie! I hope you get some nice weather soon. It has been a bit crazy here too. Super hot today and then rained really hard in the early evening and then hot again. :) Thanks for sharing with SYC.